In the late 1960s, NASA’s Apollo missions were in full swing, with both Apollos 8 and 10 having successfully launched, orbited the Moon and returned with their astronauts safely to the Earth. By the summer of 1969, the space program was ready to try something new – land a craft with men on the Moon, and then re-launch and bring them safely home. Given the numerous engineering and other difficulties inherent in the project, Apollo 11’s mission was considered extraordinarily high-risk. Accordingly, the men who were assigned to the mission, Neil Armstrong, Michael Collins and Edwin “Buzz” Aldrin, had to face the strong possibility that they would not return from the mission (particularly Aldrin and Armstrong). This was not only a major problem for the astronauts themselves, but also a more down to Earth problem for their immediate family. You see, very unfortunately back then a woman’s ability to support herself and potential children financially often came down to “find a husband.” With said husbands potentially dead on the Moon, they needed a backup plan for support. The solution here, of course, would simply be a good life insurance policy… But others were equally aware of the questionable probability of success of this particular mission. In fact, an insurance policy on the life of any of the astronauts was reported to cost at minimum several times the astronauts’ annual salaries (which were about $15,000-$20,000, or about $105,000-$140,000 today). Needless to say, this wasn’t a viable option. 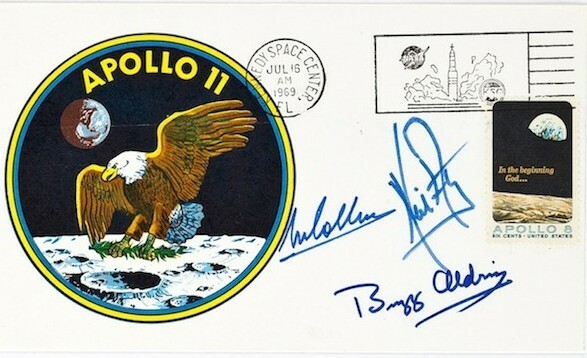 Still needing to ensure their families’ futures, and knowing the value of memorabilia associated with the missions, the Apollo 11 astronauts decided to leave behind a series of keepsake autographs, called insurance covers or postal covers. In the world of stamp and postal memorabilia collecting, cover is the term used to describe the exterior of a package or envelope. For the Apollo 11 covers, the astronauts obtained illustrated covers from two makers, the Manned Spacecraft Center Stamp Club (MSCSC Covers) and Al Bishop (Bishop Covers). Displaying various illustrations of what the Moon landing should look like, images of the mission’s emblem and even likenesses of the men and/or the Moon, the covers were rather decorative and would be highly prized, particularly if the astronauts failed to return. During the month prior to the launch, Armstrong, Collins and Aldrin had been quarantined in an effort to reduce the risk of one or all of them catching an illness that might prevent them from participating in the mission. With little else to do in their downtime, they signed hundreds of covers, and then left them with a trusted individual. On the day of the launch and/or day of the lunar landing, the individual with the covers took them to the post office to have the stamps cancelled, thus adding to the covers’ value. Of course, the men of Apollo 11 returned safely, and this unique form of life insurance turned out to have been unnecessary. But knowing a good idea when they saw one, subsequent Apollo astronauts followed in Armstrong, Collins, and Aldrin’s footsteps. As such, covers were signed by the men who flew Apollos 12, 13, 14, 15 and 16- all missions in which men were to land on the Moon. Thankfully, all returned safe and sound. You might at this point be wondering about Apollo 17. Officially, no covers were prepared by the astronauts of the final Apollo mission. Why? Mainly because of the infamous Apollo 15 stamp scandal in which the astronauts took this idea a bit further and smuggled aboard 398 unauthorized covers (to go along with the 243 authorized covers NASA had sent up in partnership with the U.S. Postal Service) which they took to the Moon and back. 100 of the 398 unauthorized covers were sold to stamp dealer Hermann Sieger for a total of $21,000 ($7,000 for each astronaut or about $40,000 each today). These were supposed to be held and not sold until after the Apollo program was over and were to serve as college funds for the astronauts’ kids. However, Sieger deciding to start selling them before the Apollo program had ended. The news media caught wind of it and the astronauts in question got in some major hot water from Congress over the ordeal, not long before the Apollo 17 mission was to launch. Needless to say, the astronauts of Apollo 17 were keen on keeping their signing of these “life insurance” covers secret and when they survived the mission, there was no reason to reveal they did it, though later some of the covers were sold or given away. Famed Astronaut Buzz Aldrin’s mother’s maiden name was Marion Moon. In the mid-1960s, the idea of a man landing on the moon was relatively inconceivable; so, when approached in 1964 with a bet that a man would land on the Moon by January 1971, bookmaker William Hill gave the punter, David Threlfall, 1000 to 1 odds. On July 20, 1969, Threlfall received a payout of £10,000 on his £10 bet. Astronauts are so brave and selfless. I cant’t imagine how could I make such a decision to fly to the moon knowing that i can not come back and see my wife never again….